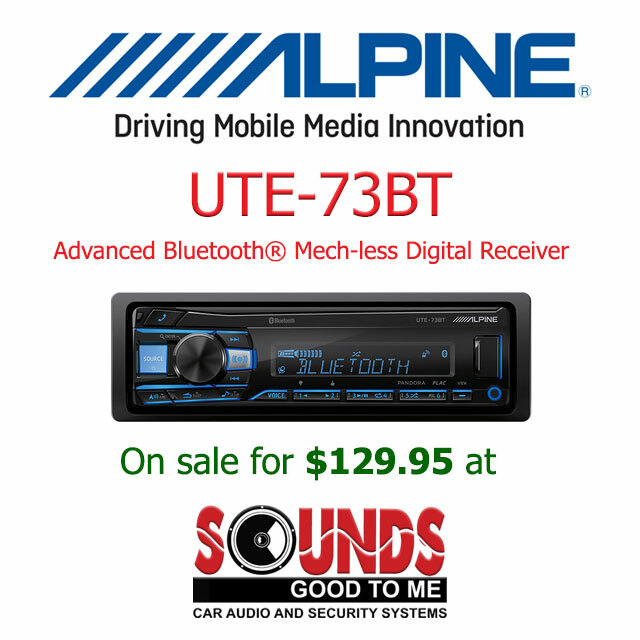 Sound in the savings with the Alpine UTE-73BT Advanced Bluetooth® Mech-less Digital Receiver, available at Sounds Good To Me in Tempe, AZ near Phoenix Arizona, on sale for $129.95. This receiver has everything you need to pump it up to 11! With 50 Watts x 4, 2 Pre-amp outputs, built-in advanced Bluetooth wireless technology with audio streaming, front USB and 3.5mm input. The UTE-73BT comes with a handy front panel auxiliary input so you can plug in a portable media player as an additional source. Made for iPod and iPhone, App Direct mode, KTP-445A Power Pack capable you can play your tunes directly from your smart phone. With all of that going for it this receiver is a steal at $129.95, so come on in, test drive the UTE-73BT Digital Receiver in one of our sounds rooms and have it installed in your vehicle on-site in Tempe, Arizona at Sounds Good To Me and drive one home today. For more information about the UTE-73BT Receiver visit www.alpine.com. Sounds Good To Me car audio & video electronics and security alarm system installation specialists are located in Tempe, AZ, servicing the entire metro Phoenix area including Mesa, Chandler, Scottsdale, Glendale and Gilbert, Arizona.Call us at (480) 968-8543, visit us at www.soundzgood2me.com or contact us by email at soundzgood2me00@yahoo.com.